PP George’s administration was notable for the strong emphasis placed on the international aspect of Rotary under the Directorship of Rtn. Charles Hale. 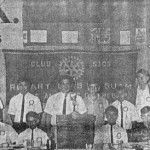 Contract was maintained with the Rotary Clubs of Picton, New Zealand; Tomworth, New South Wales, Australia; Cobran, Australia; Tokonami, Aichi Prefecture, Japan; Kobe, Japan and Masterton, New Zealand; and a 35 mm slide show depicting the activities of the Rotary Club of the Guam was prepared for exchange with matching clubs. The exchange of Interact Club members with Interact Club members from Japan and the program to meet cruise ships visiting Guam and inviting the Rotarians on those ships to the Rotary Club of Guam meetings, and to take them on tours of the island were very effective. In recognition of the Club’s active youth programs and the fostering of very strong Interact Club, the Rotary Club of Guam received an award from Rotary International for its work in this area. During PP George’s term, $50.00 savings bonds were awarded to each of the top students at the University of Guam in the freshman, sophomore and junior years. Saving bonds were also awarded to the school students producing the most effective “Career Day” posters. One of these bonds was in the amount of $50.00 and two were in the amount of $25.00 each. Notices were dispatched to and placed on ships visiting Guam giving information about the Rotary Club of Guam, the time and place of meetings, and inviting any Rotarians on board to attend the club’s meeting. 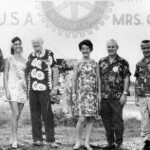 It was during PP George’s administration that the first student was granted a Rotary Foundation Fellowship through the sponsorship of the Rotary Club of Guam. The following article from the 23 October 1968 issue of the Guam Daily News provides details of this award. 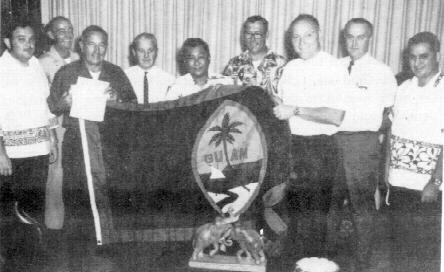 GOVERNOR CARLOS G. CAMACHO presenting members of the Rotary Club of Guam with a Guam Flag for presentation to a Rotary Club in Georgia to fly on the Street of Flags. L to R: PP Jim Underwood, PP Brandenburg, PP Al Minot, PP Jim Bloom, Gov. Camacho, Rtn. Carl Hartzell, Rev. Jordan Peck, PP George Harris, Rtn. Ted Nelson. Rotary International advises that a Rotary Foundation Graduate Fellowship has been awarded to Miss Phyllis Lorraine Crowell for the 1969-70 academic year. Miss Crowell was nominated for this award by the Rotary Club of Guam and is the First Student to receive a Rotary Foundation Fellowship through the Guam Rotary Club. The prime object of the Rotary Foundation is to contribute to international understanding through study in a foreign country and Miss Crowell’s award will be tenable at The American University of Beirut, Lebanon. Phyllis attended school on Guam from 1st grade onwards and graduated from John F. Kennedy in 1965 where she was a member College of Guam for 4 years. 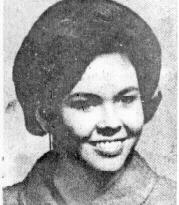 She attended the College of Guam for 1 year and then went directly to the Southern Methodist University, Dallas, Texas, In December, 1969, Phyllis will earn her Business Degree-majoring in Quantitative Analysis and will then take up he Rotary Foundation Graduate Fellowship Award at Beirut, Lebanon, for the 1969-70 academic year. She was on the Dean’s List at S.M.U. During her early school years on Guam, Phyllis was very active member of the Baptist Church at Agana Heights and was a Past Worthy Advisor in the Rainbows. Phyllis is a member of a very scholastic family. Her mother has been a teacher on Guam for the Past 12 years and gained her Bachelor of Arts and Education Degree at the College of Guam in 1965. Presently Mrs. Crowell is a Co-ordinator in the Head Start Program. Her elder sister, Stephanie, will also earn her Degree in Music at the Southern Methodist University in December of this year and her younger sister, Mary Lou, is a second year student at the University of Guam where she is studying for a Degree in Biology. Mr. Stephen Crowell is with the O.I.C.C. Guam, and is a very keen amateur radio enthusiast. 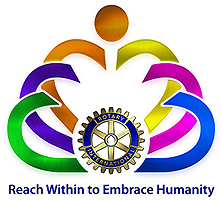 The Rotary Foundation Graduate Fellowship is calculated to cover the cost of Round Trip transportation between the Fellow’s home and the place of study registration, tuition, laboratory and other school fees, necessary books and education supplies, meals, and lodging, incidental living costs and limited educational travel during the fellowship year. As Lebanon is a French-speaking country Phyllis will be given 4 weeks of intensive French language training prior to the commencement of the Academic year. As a Graduate Fellow of the Rotary Foundation, Phyllis will have many person to person opportunities to promote International Fellowship and (Goodwill while advancing her educational goals. Prior to Phyllis being granted this Rotary Foundation Graduate Fellowship Award her application was subject to very close scrutiny by the Guam Rotary Club and then by Rotary International. The Rotary Club of Guam is delighted that Miss Crowell is the first student from Guam to receive a Rotary Foundation Graduate Fellowship and feel her outstanding attributes fits her to become a very worthy Ambassador and know she will contribute to international fellowship and understanding which is the prime objective of the Rotary Foundation.